Michael and his mother, Myrta, September 6, 1963. 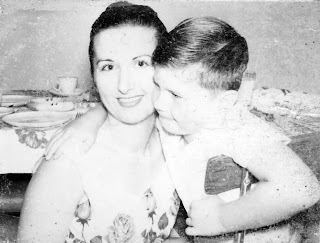 My mother, Myrta, died when I was 17. She suffered from mitral valve stenosis and died during or immediately following surgery to correct this problem. She never saw my first professional publication, but she was instrumental in my success—not just for encouraging my dream, but also for repeatedly providing me with the tools for success. This is the story of three typewriters and a desk. My mother presented me with my first typewriter when I was attending sixth grade at Sherman Elementary in Tacoma, Washington. 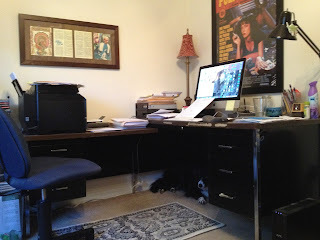 I don’t know where she found the hulking black beast (it may have been an Underwood) that dominated my tiny desk from the moment it arrived, but on it I taught myself to type by hunting and pecking at the keys. Though I did not know then that I wanted to be a writer, I was the only sixth-grader in my school typing his homework assignments, and I continued using the hulking black beast as its mechanical parts degenerated to the point where I had to type by striking the keys with the ball-peen side of a ball-peen hammer. On it, I typed my first short story, “The 1812 Battle at Two Rocks.” This is the story I showed my mother when I told her I wanted to be a writer. The beast did not travel with us when we left Tacoma and moved to Ft. Bragg, California, partway through ninth grade. That Christmas my mother gave me my second typewriter, a small blue portable (it may have been a Smith-Corona) that bounced across my desk when I typed because I still pounded typewriter keys as if I were assaulting the hulking black beast of my youth. On it, I wrote “The Magic Stone,” which became my first professional short story sale. A children’s fantasy, elements of “The Magic Stone” were taken directly from an experience I shared with my mother when I was in grade school. After my mother’s death, I returned to Tacoma to live with my grandparents, and later moved to Glen Carbon, Illinois, to attend Southern Illinois University at Edwardsville. I dropped out during the first quarter of my second year and moved to Collinsville, Illinois. In early 1978, my stepfather and I settled the medical malpractice suit filed following my mother’s death, and I used some of the money I received to purchase two filing cabinets I still use, the desk at which I sit as I write this, and a blue, wide-carriage, IBM Correcting Selectric II. On it, I wrote “City Desk,” which became my second professional short story sale and first mystery. I wrote a great many other stories on the Selectric before I replaced it with a DOS-based personal computer running WordStar. During the years since, I’ve owned and used many PCs and Macintoshes, and now use Microsoft Word rather than WordStar. Ellie, Michael's frequent writing companion, under the desk. Though I still own the Selectric, it no longer functions properly and sits on a shelf in the closet. The desk I purchased with money from the malpractice suit—a black steel office desk with a faux wood-grain top and a secretarial arm—has traveled with me through several residences in Illinois, two in Mississippi, and two in Texas, and I have written all or part of every story since 1978 while sitting at this desk. My mother did not live to see the writer I’ve become—and I’ve written a few things I never would have shown her if she had!—but she’s been with me for the entire journey. Her literal heart may have failed her, but her figurative heart—her soul—remains. Michael, your story about your mother and your various typewriters is very poignant. I’m sorry she wasn’t around to see your success. And it sounds like we were on similar trajectories. I didn’t have an Underwood myself, but I do remember them well from my dad’s business and have one now as a decorative item in my office. But I had the Smith-Corona portable in blue, a couple of Selectrics, one of which I still have, but like yours is gathering dust. And wow, weren’t they the coolest things when they came out. And, of course, a series of computers, starting with a two-floppy drive, no hard drive system way back when. Beautiful piece, Michael. I'm sure your mom would be very proud of you and your writing. A lovely piece about your mom. It's great that your mother supported your dream, Michael. I'm sure she's still reading over your shoulder. I thought I wanted to write, and it was settled when my mother, a one-time secretary, actually typed up some of my early hand-written stories (I was nine or ten). Once I saw how they looked in print, there was no going back. A very touching piece, Michael, which brought back fond memories of my own typewriters and desks past. Thanks! I really enjoyed the piece, Michael. I too have worked my way from the black beast to the tiny smith-corona to a selectric to the current computer. Technology rising all the time! I have similar memories, except my mother belittled my ambitions & we didn't have a Smith-Corona. My father taught me how to type when I was seven, on an old Underwood. Later we got an Olivetti portable. I can't even guess how many Selectric typing elements I went through. My daughter used to call them typing "helmets" ... if a tooth broke off the ball, it was ruined & new ones cost at least $20. Beautiful tribute, Michael. Your dear mother would be very proud. Elizabeth, we've all had people in our lives who did not encourage or support our creative efforts, and I'm certain it hurts worse when one of them is a parent. I know many people whose parents did not encourage them, so I realize how lucky I am that my mother did. Lovely, and affecting. I remember my own Hermes portable, which traveled with me through Europe, and my crowning joy, an IBM correcting Selectric, and of course the first PS Model 2 with PFS: Professional Write. Funny, that similar chronology. Bless her, your mom. Nicely written. Reading about a writer's journey is always interesting, yours especially so. Thanks for sharing. What a wonderful story. My first typewriter came from Sears and you could type in a line of text on a screen, hit ‘Enter’ and it would type it out. It got me through college. Until I got my first laptop. The desk I used up until I moved after selling my mother’s house was a ‘Student’ desk that my mother bought when I was in the 6th grade? My dad died when I was quite young so it was just my mother, my sister & me. She knew I wrote & was quietly pleased. My (older) sister knows I write & has no problem telling me if she doesn’t like something I write. She’s liked everything I’ve written so far. I do remember looking at my mother’s manual typewriter. It was an Underwood, I think, and wondering how she used it. Oddly enough, I had a computer before a typewriter. My mom managed to Marshall her budget together & buy me an Apple II c complete with printer! That printer outlasted the computer by a couple of years but neither made it to college, hence the typewriter. I enjoyed your story Michael. My husband made his living repairing these typewriters and He would bring one home for me to try every so often. My mother loaned me hers until she found out I was writing Confession stories on hers. She came and got it saying "God told her I shouldn't be writing those stories." That's when my typewriter repair husband bought me a nice one that I used for years. I am sure your mother has been proud of your success. She sounds like a wonderful mother. Oh man, Michael. You made me emotional about typewriters! But no one's surprised you could pull off a beautiful little article like that. Thanks, everyone. I'm glad you enjoyed my post! Your mother would have liked this piece....as well as all the others her son has typed. I remember those typewriters...Royals, etc. to learn to type; Smith-Coronas for most of us as our first major typewriters when the idea of computers were still mainframes...to minis and desk tops to the laptops we can't remember living without. Gorgeous piece, Michael. Your mother would be proud--even of those pieces you wouldn't dare show her. Catching up on posts--what a great story here, Michael, great group of stories. Thanks for sharing. This is a wonderful story about your mother and her way of supporting you. She must have seen something in you that told her you were going to be a writer. I learned to type on my mother's 1930s black monster, which she got when she was in college. When I went off to college, my parents gave me a Hermes (green), which I still have. I bought a Selectric and loved it, but gave that up for a computer, and finally learned to love computers when I got a Macintosh in the 1990s. But I keep the Hermes nearby because there's something special about pounding those keys. Wow. The comments continue. As I've said before: Thanks, everyone. Really touching tribute to your mother, Michael. I am sure she would be proud of the man you've become. Your post brought back many memories of typewriters and computers past! I remember how excited I was to get an electronic typewriter that could correct the last line I typed without the use of white out or correction tape. And I'm so glad you had such a wonderful and supportive mother, Michael! Heart warming story and brings back some nice memories. Loved my Blue Smith Corona! Really beautiful tribute. Thank you for sharing.